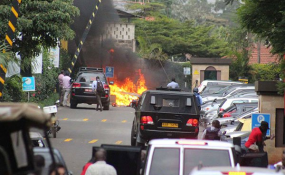 The scene of the terror attack at the DusitD2 hotel in Nairobi on January 15, 2019. Football Kenya Federation on Wednesday joined other Kenyans in condemning the terrorist attack on 14 Riverside Drive on Tuesday. "We take this earliest opportunity to not only express our deepest condolences to the bereaved families but also wish all those who were injured in the attacks a quick recovery," said FKF in a statement Wednesday. "In light of the aforementioned and in the spirit of patriotism, FKF calls on all clubs, especially those participating in the two top tier leagues, to stand in solidarity with the Riverside Drive victims, by observing a minute of applause during their upcoming fixtures scheduled for this weekend January 20, 2019." A minute of silence was observed before the kick off of the SportPesa Premier League pitting champions Gor Mahia against Mount Kenya United on Wednesday at Kasarani in honour of Tuesday's Riverside terror attack victims among them football enthusiast James Oduor Radido alias Cobra. Cobra was an ardent Gor Mahia and local football fan. Football Kenya Federation Nick Mwendwa had on Wednesday led tributes for the man described by sports enthusiasts as a 'ray of hope' in Kenyan football. "Fare thee well my friend. Your good spirit will live on in football. You did your part. We shall do ours and remember you," Mwendwa tweeted.